Students must be able to define MASS (p.293), INERTIA(p.293), and MOMENTUM(p.294). 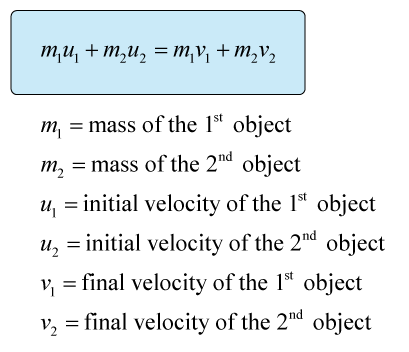 Students should know the formula and unit labels for Momentum (p.294). Watch this video on momentum in Football. Students should be able to graphically depict an example of the Conservation of Momentum including labels (such as on p. 296-7). Watch this video from the International Space Station. Page 298 Self-check #6 ONLY - Create a picture depicting the problem and the solution. REMEMBER, the total momentum of the system before the collision MUST equal the total momentum of the system after the collision!